AFTER my sprint triathlon on Sunday I’d had 24 hours off before setting off with Ben Smith of The 401 Challenge, on his 22nd marathon of 401 marathons that he’s running on consecutive days. I didn’t commit to running the full 26.2 per se… but inside I already had committed truth be told. And not least because I’d signed up to the ‘run a marathon this month’ trophy on Strava. Even though my body needed rest, I didn’t listen this time, because here was an opportunity to make history with Ben on my parents doorstep, and as such wearily I was greeted by my concerned looking mum last night, who brought me tea and a blanket to ease my shivery bod and aching limbs after a day collecting stories out in the elements. Come mile 26.2, I fared much worse than Ben, who completed his 22nd marathon with a spring in his Zoot-sponsored step. 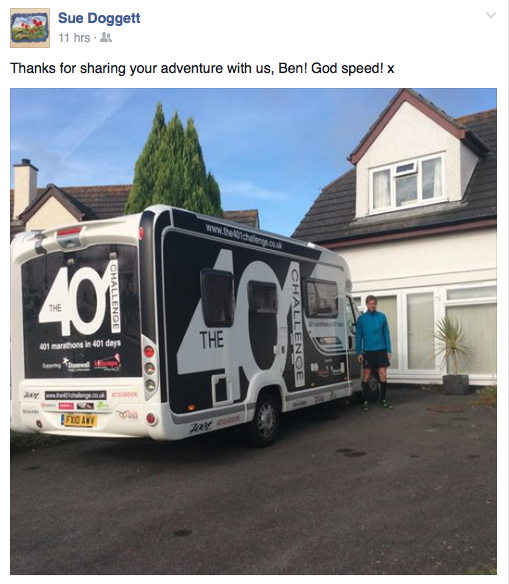 Ben had arrived at my parents house where I was holidaying for 48 hours after my triathlon in Devon, arriving straight after his 21st marathon. He rocked up with his enormous camper van outside the house, and I ran out to greet him. He said it was lovely to see a familiar face, and he was to see a couple more, because the next day there were three of us Southvillers accompanying Ben at the start of his 22nd day of running. We set off from St Ives railway station at midday, and very quickly got a soaking. we’d climbed up towards the Stennock and out towards Zennor, along the most beautiful coastal road which I’d ventured along on a hired hybrid bike in a pair of jeans with my bestie a few months before getting my first road bike around two years ago now. First warm up stop was the Tinner’s Arms, where I did a jolly good job of spilling water from my CamelBak all over the floor several times. We headed on towards Penzance, and up a hill which gave us views of two bays, the north and south which was beautiful. Lovely Jo and Kath (plus support crew Dan and baby Jess!) left after 10 miles of laughter, horse-stroking and waving at every car to wend our way alone to the 21 mile point at which we’d join Hayle Runners for the last five miles. Those 10 miles into Hayle were stunning. The sun beamed down on us – it was officially the very last day of summer, and it felt every bit of it with the Autumn sunshine bringing out the freckles on our faces and drying my various wet layers flapping off the back of my bag! We passed the most amazing Dhalia garden on the way down to the south coast. We frolicked amongst the pretty colours and took loads of photos. We talked about life and generally had a great soul cleansing run. We finally arrived in Hayle at 6pm ish, where we were due to set off at 7pm with Hayle Runners. By the time we set off I was absolutely freezing. The darkness fell and we headed off with a group to do a 5 mile loop of the Saltings. It was beautiful, and I met a lovely girl called Morwenna who runs with the club every week. We gelled and talked about our respective lives in Bristol and Cornwall. The last two miles hurt so much. I was willing it to be over. My legs were seizing up. Ben, conversely, was skipping up a hill shouting ‘come on guys!’ with a smile on his face. Incredible, so full of beans after 23 miles. Until this day I had wondered how anybody could run 401 marathons in 401 days, but I realised then, at that hill-skipping moment that this was someone who has a special something, and not just the ability to still feel incredible after 20 miles of Cornish hills. Back at the Hayle Rugby Club, I switched off my Garmin at 26.2 miles with a long-awaited beep and a sigh, and hugged Ben. My third ever marathon. I felt emotional. It had been a glorious day of stunning views and laughter with friends, thinking about the important things in life and meeting new people. I was exhausted last night and I still am. I got up at 4am today and drove 200 miles to work, so I am going to sleep soon! Ben however will have just finished his 23rd marathon, and will be doing his 24th tomorrow, and so on until all 401 have been completed, in just over one year’s time from now. I’m too tired to write any more, but I will say that if you have the chance to run with Ben (which everyone does – check out his website and see when he is running near you!) then you must do it, whether it’s for 5k or a marathon. It’s really a joyful experience on a multitude of levels which are hard to impart, so you’ll just have to find out for yourself. One final thought springs to mind though.